Last summer the heat in Los Angeles was so incredibly oppressive we ended up drinking these Strawberry Pomegranate Slushies non-stop. I would get out of the car to pick up the kids after school and just start sweating. I wasn’t even doing anything beyond walking and just dripping. I try to get the kids in the car as fast as possible on these days to avoid tempers from flaring and so they don’t melt. I usually give them a second chance at their lunches if there’s any food remaining, but I know all bets are off when they’re hot and exhausted. Generally the first thing they do is ask for something cool to drink as they buckle into their car seats, so I try to bring treats to sip on as we head home. This Strawberry Pomegranate Slushie is a total score. 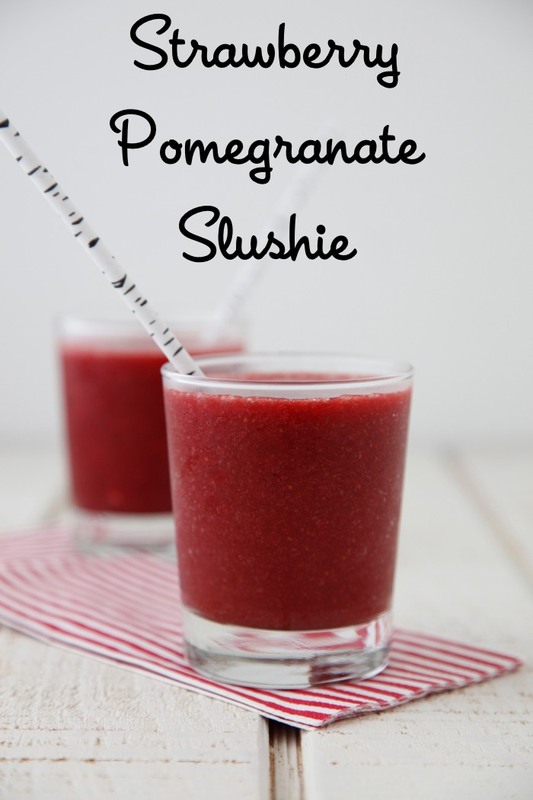 You can see the look on their over heated pink faces as the slurp away at the cool crushed ice and sweet flavor from the strawberries and small amount of pomegranate juice to give it a big boost of flavor. As the heat has been rising over the past few weeks, this frosty drink has been coming to mind. I created this recipe for my ’Snack Mom’ column in Parents Magazine to share with other mom’s one of our favorite sips. I hope your kids can enjoy the hot days of summer if you’re anywhere as hot as LA and devour this tasty treat! 1. Place all ingredients in the blender and pulse until smooth. Hi! Do you add any water at all? This is delicious!! So glad I bought my fancy new blender!